Paisley Park, Chanhassen, Minnesota, U.S. In 1993, while in a contractual dispute with Warner Bros., he changed his stage name to an unpronounceable symbol ( ), also known as the "Love Symbol," and began releasing new albums at a faster rate to remove himself from contractual obligations. He released five records between 1994 and 1996 before signing with Arista Records in 1998. In 2000, he began referring to himself as "Prince" again. He released 16 albums after that, including the platinum-selling Musicology (2004). His final album, Hit n Run Phase Two, was first released on the Tidal streaming service on December 2015. Five months later, at the age of 57, Prince died of an accidental fentanyl overdose at his Paisley Park recording studio and home in Chanhassen, Minnesota. Prince's innovative music integrated a wide variety of styles, including funk, rock, R&B, new wave, soul, psychedelia, and pop. He has sold over 100 million records worldwide, making him one of the best-selling music artists of all time. He won eight Grammy Awards, six American Music Awards, a Golden Globe Award, and an Academy Award for the 1984 film Purple Rain. He was inducted into the Rock and Roll Hall of Fame in 2004. Rolling Stone ranked Prince at number 27 on their list of 100 Greatest Artists of All Time. 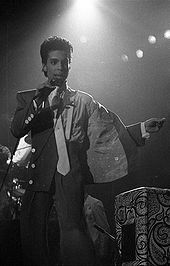 In 1993, in rebellion against Warner Bros., which refused to release Prince's enormous backlog of music at a steady pace, Prince officially adopted the aforementioned "Love Symbol" as his stage name. In order to use the symbol in print media, Warner Bros. had to organize a mass mailing of floppy disks with a custom font. At this time, Prince was alternatively referred to as "The Artist Formerly Known as Prince" or simply "The Artist". On April 19, 2017, an EP featuring six unreleased Prince recordings, titled Deliverance, was announced, with an expected release date for later that week. The next day, Prince's estate was granted a temporary restraining order against George Ian Boxill – an engineer who co-produced the tracks and was in possession of the master tapes – and halted the release of the EP. Finally, the estate obtained 4 millions of dollars in court. Prince was romantically linked with many celebrities over the years, including Kim Basinger, Madonna, Vanity, Sheila E., Carmen Electra, Susanna Hoffs, Anna Fantastic, Sherilyn Fenn, and Susan Moonsie. He was engaged to Susannah Melvoin in 1985. In 1990, he met 16-year-old Mayte Garcia backstage in Germany after he saw a tape of her dancing. After graduating high school, she began working as one of his backup singers and dancers. When she was 19, he instructed her to get on birth control, thus beginning their sexual relationship. They were married on February 14, 1996; he was 37 and she was 22. They had a son named Amiir Nelson, who was born on October 16, 1996, and died a week later on October 23 after suffering from Pfeiffer syndrome. The distress of losing a child and a subsequent miscarriage took a toll on the marriage, and the couple divorced in 2000. In 2001, Prince married Manuela Testolini in a private ceremony. They separated in 2005 and divorced in May 2006. ↑ Bobb, Brooke (April 19, 2018). "Meet the Man Who Made 3,000 Pairs of High Heels for Prince". Vogue. Retrieved January 6, 2019. 1 2 3 4 5 6 7 8 Cole 2005, p. 226. 1 2 Lavezzoli 2001, p. 92. 1 2 Touré 2013, p. 3. ↑ Pareles, Jon (April 21, 2016). "Prince, an Artist Who Defied Genre, Is Dead at 57". The New York Times. ISSN 0362-4331. Retrieved April 27, 2016. 1 2 3 Petridis, Alexis (November 12, 2015). "Prince: 'Transcendence. That's What You Want. When That Happens – Oh, Boy.'". The Guardian. Retrieved April 21, 2016. ...a man who can play pretty much any instrument he choses [sic], possessed of a remarkable voice that can still leap effortlessly from baritone to falsetto. ↑ Keith Caulfield; Gary Trust (April 22, 2016). "Chart Royalty: Prince's Hot 100 & Billboard 200 Highlights". Billboard. Retrieved February 12, 2017. ↑ Taneja, Nikhil (December 9, 2008). "Those chart busters". Hindustan Times. Mumbai: HT Media. OCLC 231696742. Archived from the original on May 21, 2009. Retrieved April 18, 2009. ↑ "Prince – Past Grammy Awards". Google.co.uk. ↑ "Prince, American Music Awards". google.co.uk. ↑ "Golden Globe Awards". goldenglobes.org. Archived from the original on December 15, 2009. Retrieved February 27, 2010. ↑ "Nominees & Winners for the 57th Academy Awards". Academy of Motion Picture Arts and Sciences. Archived from the original on March 9, 2010. Retrieved May 12, 2016. ↑ "Tavis Smiley". pbs.org. April 27, 2009. Archived from the original on May 5, 2009. 1 2 3 Thompson, Ahmir (March 24, 2004). "100 Greatest Artists". Rolling Stone. Retrieved May 4, 2016. ↑ Gabler, Jay. "Prince's childhood homes: MnDOT research helps create a timeline". The Current. ↑ Nicolson, Barry (April 22, 2016). "Prince Obituary: June 7, 1958 – April 21, 2016". NME. Retrieved June 7, 2018. ↑ Smolenyak, Megan (February 8, 2013). "Hey, Prince, Your Roots Are Showing". The Huffington Post. Retrieved February 12, 2013. 1 2 3 Woodworth, Griffin (2013). "Prince, Miles, and Maceo: horns, masculinity, and the anxiety of influence". Black Music Research Journal. 33: 117+. ↑ Gulla 2008, p. 483. ↑ Ro 2011, p. 6. ↑ Lynch, Jason (April 28, 2009). "Prince Talks about His Struggle with Epilepsy". People. Retrieved May 4, 2016. ↑ "Microsoft Word – 126883449_1.docx" (PDF). Mncourts.gov. Retrieved March 9, 2017. ↑ Nilsen 2003, p. 19. 1 2 3 "Obituary: John Nelson". The Independent. September 1, 2001. Archived from the original on September 19, 2011. Retrieved April 25, 2016. ↑ "Biography – Prince: Idiosyncratic, Individualistic, Innovative, Ingenious". Purplerain120.weebly.com. Retrieved December 23, 2017. ↑ "André Cymone". Retrieved December 11, 2010. ↑ Sweeting, Adam (April 22, 2016). "Prince obituary". Theguardian.com. Retrieved December 23, 2017. ↑ Caroline Palmer (May 5, 2016). "Dancers recall Prince as a hard-working 'darling' in tights and ballet slippers". Star Tribune. Retrieved May 3, 2018. ↑ Rothman, Michael (March 4, 2015). "Prince's Bryant Junior High Basketball Photo is Amazing". ABC News. Retrieved May 1, 2016. ↑ Tevlin, Jon (March 13, 2004). "The Quiet One: A High School Classmate Recalls the Artist as a Young Man". Star Tribune. Retrieved May 4, 2016. ↑ Nolfi, Joey (April 21, 2016). "Jimmy Jam Remembers School Days with Prince: 'Everything was so Forward Thinking'". Entertainment Weekly. Retrieved April 23, 2016. ↑ Kissell, Ted B. (May 2, 2016). "Prince's first manager reflects on the music icon's early days". UCLA Newsroom. Archived from the original on May 3, 2016. Retrieved May 6, 2016. ↑ Light 2014, p. 29. ↑ Norment, Lynn (January 1997). "The Artist Formerly Known as Prince". Ebony. p. 130. Retrieved April 21, 2016. While he retains the publishing rights to all his songs, Warner Brothers owns the master tapes to the 20 albums preceding Emancipation. ↑ Uptown 2004, p. 19. ↑ "BMI | Repertoire Search". Repertoire.bmi.com. Archived from the original on October 30, 2007. Retrieved July 18, 2009. ↑ "Profile for Controversy Music". Ascap.com. Archived from the original on August 7, 2014. Retrieved July 18, 2009. ↑ Moss, Corey (November 13, 2002). "Y Kant Artists Spell? Christina, Jimmy Jam, K-Ci Explain". MTV. Retrieved April 15, 2013. ↑ Cashmore 1997, p. 147. ↑ "CNN – World Beat Biography – Prince – December 20, 1999". CNN. Retrieved July 18, 2009. ↑ "Five History-Making MTV Music Videos". New York. October 9, 2011. Retrieved May 4, 2015. ↑ Buckley 2003, p. 819. ↑ "Music's 30 Fiercest Feuds and Beefs". Rolling Stone. 1 2 Weiss, Shari (April 21, 2016). "Grammys Mourn Prince – See Statement From Grammy Awards Recording Academy". Gossipcop.com. Retrieved April 24, 2016. 1 2 "Rhino Historic Tours: Prince Kicks Off the Purple Rain Tour". Rhino.com. 2014. Retrieved April 21, 2016. 1 2 3 Raftery, Brian (July 2009). "Purple Rain: The Oral History". Spin. pp. 54–61. Retrieved April 21, 2016. 1 2 3 Light 2014, p. 50. 1 2 3 Moskowitz 2015, pp. 483–489. ↑ Light 2014, p. 163. ↑ "The 57th Academy Awards: 1985". Oscars.org. Academy of Motion Picture Arts and Sciences. Archived from the original on April 2, 2016. Retrieved April 22, 2016. ↑ "The Rock and Roll Hall of Fame and Museum". Retrieved February 27, 2010. ↑ "Purple Rain (1984) – Box Office Mojo". 1 2 3 Wete, Brad; Letkemann, Jessica; Caulfield, Keith (June 24, 2013). "Prince's 20 Biggest Billboard Hits". Billboard. Archived from the original on December 19, 2015. Retrieved April 22, 2016. ↑ Gulla 2008, p. 482. ↑ Light 2014, p. 181. ↑ "500 Greatest Albums of All Time". Rolling Stone. May 31, 2012. Retrieved May 6, 2016. ↑ Cruz, Gilbert (February 22, 2011). "The All-Time 100 Albums". Time. Retrieved May 3, 2016. ↑ Vox, Tristan. "Purple Fame: An Appreciation of Prince at the Height of His Powers. November 1984". Vanity Fair. Retrieved April 21, 2018. ↑ Siegel, Robert. "Tipper Gore and Family Values : NPR Music". NPR. Retrieved July 18, 2009. ↑ Macdonald, Cameron (January 23, 2006). "Treating Dandruff by Decapitation". Stylus. ↑ Stuckey, J. Ken. "Prince's Legacy: 'Set your mind free'." The Gay & Lesbian Review Worldwide, vol. 23, no. 5, 2016, p. 20+. ↑ Calia, Michael (April 21, 2016). "A Look Back at Prince in the Movies". The Wall Street Journal. Archived from the original on April 22, 2016. Retrieved April 22, 2016. ↑ "R.I.P. Razzie "Winner" and Under the Cherry Moon Star Prince..." Golden Raspberry Awards. Archived from the original on April 13, 2016. Retrieved April 22, 2016. ↑ Corson 2016, p. 196. 1 2 Draper 2008, pp. 76–78. ↑ Draper 2008, p. 80. 1 2 3 4 5 6 Erlewine, Stephen Thomas. "Sign 'O' the Times". Billboard. Archived from the original on May 9, 2013. Retrieved March 3, 2009. 1 2 3 4 "Artist Chart History – Prince". Billboard. Archived from the original on June 10, 2008. Retrieved January 13, 2009. ↑ Draper 2008, p. 81. ↑ Gregory 1995, p. 246. ↑ Matos 2004, p. 57. 1 2 3 Draper 2008, pp. 86–87. 1 2 Hahn 2004, p. 118. ↑ Draper 2008, p. 90. ↑ Draper 2008, p. 92. ↑ Draper 2008, p. 91. ↑ Hahn 2004, pp. 121–122. ↑ Draper 2008, p. 93. ↑ "Lovesexy". Billboard. Archived from the original on May 9, 2013. Retrieved January 13, 2009. ↑ Draper 2008, p. 94. ↑ Hahn 2004, pp. 152–153. ↑ Draper 2008, p. 95. ↑ Hahn 2004, pp. 155–156. ↑ Draper 2008, p. 96. ↑ Erlewine, Stephen Thomas. "Batman". Billboard. Archived from the original on May 9, 2013. Retrieved January 13, 2009. ↑ Hahn 2004, p. 157. ↑ Hahn 2004, p. 166. ↑ Draper 2008, p. 104. ↑ "Graffiti Bridge". Billboard. Archived from the original on May 9, 2013. Retrieved January 13, 2009. ↑ Draper 2008, p. 105. ↑ Hahn 2004, p. 177. 1 2 "Discography (more) – Prince – Sign 'O' the Times". Billboard. May 9, 1987. Archived from the original on May 9, 2013. Retrieved July 18, 2009. 1 2 3 Carter, Andrew (June 23, 1999). "The People Formerly Known as Fans". City Pages. Archived from the original on October 14, 2008. Retrieved December 12, 2007. ↑ "Billboard Chart positions for Prince". Retrieved May 29, 2010. 1 2 Hahn 2004, p. 187. ↑ Hahn 2004, pp. 192–193. ↑ Lussenhop, Jessica (April 22, 2016). "Why did Prince change his name to a symbol?". BBC News. Retrieved May 5, 2016. ↑ "Prince hated contract law so much he once changed his name to an unpronounceable symbol". Legal Cheek. ↑ Feldman, Brian (April 21, 2016). "The Legend of Prince's Special Custom-Font Symbol Floppy Disks". New York. Retrieved May 5, 2016. 1 2 Coryat, Karl (November 1999). "His Highness Gets Down". Bass Player magazine. Retrieved April 24, 2016. ↑ "12 Wildest Prince Moments". Rolling Stone. ↑ "ASCAP profile for Emancipated Music". Ascap.com. Archived from the original on December 31, 2003. Retrieved July 18, 2009. ↑ "Chart history for 'One of Us'". Billboard. Archived from the original on May 21, 2008. Retrieved July 18, 2009. ↑ "BMI credits for "Betcha By Golly Wow!"". Repertoire.bmi.com. Archived from the original on October 30, 2007. Retrieved July 18, 2009. ↑ "BMI credits for "I Can't Make You Love Me"". Ascap.com. Archived from the original on July 6, 2003. Retrieved July 18, 2009. ↑ "BMI credits for "La-La Means I Love You"". Repertoire.bmi.com. Archived from the original on October 30, 2007. Retrieved July 18, 2009. ↑ "Prince Sign of the Times". Socialbilitty. May 8, 2016. Retrieved January 17, 2017. ↑ Bugbee, Teo (June 25, 2015). "Taylor Swift Follows Prince: The Artist Who Tamed the Corporate Giant". The Daily Beast. Retrieved May 8, 2016. ↑ Rys, Dan (April 21, 2016). "Prince and Beyonce at the 2004 Grammy Awards: The Story Behind How the Duet Came Together". Billboard. Retrieved April 23, 2016. 1 2 Sweeting, Adam (April 22, 2016). "Prince obituary: 'the music flowed out in an unstoppable torrent'". The Guardian. Retrieved April 23, 2016. ↑ Ryan, Patrick (April 21, 2016). "6 of Prince's most legendary live performances you need to see". USA Today. Retrieved April 23, 2016. ↑ Wiederhorn, Jon (March 16, 2004). "Kid Rock Makes Jokes, Prince Makes Peace at Rock Hall Ceremony". MTV News. Retrieved April 23, 2016. ↑ Brucculieri, Julia (April 21, 2016). "Alicia Keys' Rock And Roll Hall of Fame Speech For Prince Perfectly Captures His Greatness". The Huffington Post. Retrieved April 23, 2016. ↑ Pareles, Jon (March 16, 2004). "Prince and Harrison Among Rock Hall of Fame Inductees". The New York Times. Retrieved April 23, 2016. ↑ Nekesa, Mumbi Moody (March 16, 2004). "Prince reigns at Rock and Roll Hall of Fame induction". Seattle Post-Intelligencer. Retrieved April 23, 2016. ↑ Locker, Melissa (April 21, 2016). "Watch Prince's Show-Stopping Guitar Solo at the Rock and Roll Hall of Fame". Time. Retrieved April 27, 2016. ↑ Greenblatt, Mike (May 25, 2011). "Jimi Hendrix: South Saturn Delta & Various Arists: Power Of Soul: A Tribute To Jimi Hendrix". The Aquarian Weekly. Retrieved April 25, 2016. ↑ D'Angelo, Joe (May 28, 2004). "Billboard Sours on Prince's Musicology Sales Experiment: Magazine changes policy on tallying albums sold with tickets". MTV News. Retrieved May 6, 2016. ↑ "Prince Tops Frontmen Poll". Contactmusic.com. July 27, 2004. Archived from the original on June 29, 2013. Retrieved June 29, 2013. ↑ "Prince Crowned 'Top Music Earner'". BBC News. February 9, 2005. Retrieved May 12, 2016. ↑ Thompson, Desire (April 23, 2016). "'Saturday Night Live' Announce 'Good Night Sweet Prince' Tribute". Vibe. Retrieved May 8, 2016. ↑ Sandoval, Greg (November 13, 2007). "Prince: The artist who formerly liked the Internet". CNET. Retrieved April 23, 2016. ↑ Ohlheiser, Abby (April 21, 2016). "Prince had a complicated relationship with the Internet". The Washington Post. Retrieved April 23, 2016. 1 2 Finn, Natalie (July 13, 2006). "Prince Site Fades to Black". E! Online. Retrieved April 23, 2016. ↑ "Prince's NPG Music Club Shutting Down". Billboard. July 12, 2006. Retrieved April 23, 2016. ↑ Brandle, Lars (April 21, 2016). "Watch Prince Masterfully Perform 'Purple Rain' and 'Let's Go Crazy' at 2006 Brit Awards". Billboard. Retrieved April 23, 2016. ↑ "You booty at BET awards". The Sydney Morning Herald. June 29, 2006. Retrieved April 23, 2016. ↑ "Golden Globe Awards". goldenglobes.org. Archived from the original on July 13, 2010. ↑ Dave Hoekstra (February 5, 2007). "Purple Rain Turned Super". Chicago Sun-Times. Archived from the original on April 12, 2009. Retrieved February 5, 2007. ↑ "10 Best Super Bowl Halftime Shows". Billboard. January 30, 2015. Retrieved April 21, 2016. ↑ "Prince Shows Sell Out in Minutes". NME. May 11, 2007. Retrieved July 18, 2009. ↑ "Prince extends tour". Yahoo! Music News. June 11, 2007. Archived from the original on April 27, 2011. Retrieved July 18, 2009. ↑ Allen, Katie (June 29, 2007). "Music industry attacks Sunday newspaper's free Prince CD". The Guardian. UK. Retrieved July 18, 2009. ↑ DeRusha, Jason (July 7, 2007). "Prince Thrills Fans With 3 Minneapolis Shows". wcco.com. Archived from the original on June 18, 2010. ↑ "Prince plays 3 shows in his hometown". USA Today. July 8, 2007. ↑ "Prince's Manager Shortlisted For Asian Woman of Achievement Award". MTV News. Retrieved September 30, 2014. ↑ Sulugiuc, Gelu (April 28, 2008). "Prince reigns at California music festival". Reuters. ↑ "Prince settles cancelled Dublin gig case". BBC News. February 26, 2010. Retrieved May 12, 2016. ↑ Pogatchnik, Shawn (March 26, 2010). "Prince ordered to pay Irish promoter $3 million". Associated Press. Archived from the original on March 29, 2010. ↑ "Singer Prince Settles Lawsuit Over Axed Dublin Gig". Boston Globe. February 26, 2010. ↑ Kreps, Daniel (December 18, 2008). "Prince Premieres Four New Songs on L.A.'s Indie 103; New Album on the Way". Rolling Stone. Retrieved April 16, 2012. ↑ Powers, Ann (December 19, 2008). "103.1 debuts new Prince tracks". Los Angeles Times. ↑ "Tickets to Prince's Paris Shows Sell out in 77 Minutes". Agence France-Presse. October 9, 2009. Archived from the original on April 1, 2013. Retrieved April 22, 2016. ↑ Anthony, Steven (October 26, 2009). "All Day, All Night – How I Spent My Weekend at Paisley Park". The Musictionary. Archived from the original on October 31, 2009. ↑ "Prince Releases Minnesota Vikings Song". myfox9.com. January 21, 2010. Archived from the original on March 16, 2010. ↑ Kreps, Daniel (February 26, 2010). "Prince Gives New 'Cause and Effect' to Minnesota Public Radio". Rolling Stone. Retrieved May 5, 2016. ↑ "Full List – The 2010 TIME 100". Time. April 29, 2010. Retrieved August 4, 2010. ↑ "Prince Covers Ebony's July 2010 Issue". Entertainment Rundown. June 7, 2010. ↑ "Prince To Be Honored By BET". Billboard. September 14, 2009. Retrieved August 4, 2010. ↑ Paine, Andre (September 14, 2009). "Prince To Release '20Ten' For Free in Europe". Billboard. Retrieved August 4, 2010. ↑ Bream, Jon (October 5, 2010). "Prince postpones concert in Helsinki". Star Tribune. Retrieved May 5, 2016. ↑ Sever, Brooke (September 28, 2010). "Kanye West and Prince join F1 line-up". digitalproductionme. ↑ "Official PRINCE Tour Announcement". Drfunkenberry.com. September 30, 2010. Retrieved October 9, 2010. ↑ "New Prince Song Snippet!~ "Rich Friends" Listen Now". Drfunkenberry.com. October 8, 2010. Retrieved February 4, 2011. 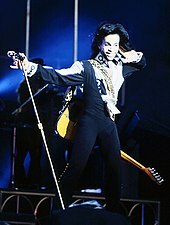 ↑ "Prince Rocks Opening Night of His 'Welcome 2 America' Tour at the Izod". Drfunkenberry.com. December 16, 2010. Retrieved February 4, 2011. ↑ "PRINCE & The Revolution's "Purple Rain" Get Grammy Induction + My Thoughts". Drfunkenberry.com. December 7, 2010. Retrieved February 4, 2011. ↑ "Prince Presents Barbra Streisand With Award; Gives Away 1.5 million To Charities". Drfunkenberry.com. February 12, 2011. Retrieved February 20, 2011. ↑ "Exclusive! Prince Not Happy With "Glee" Over Use Of "Kiss"". Drfunkenberry.com. February 12, 2011. Retrieved February 20, 2011. ↑ Lee, Ann (March 30, 2012). "Prince to Join Morrissey and Brandon Flowers at Hop Farm Festival 2011". Metro. Retrieved April 16, 2012. ↑ "Prince released new song "extraloveable"". Drfunkenberry.com. November 23, 2011. Retrieved December 6, 2011. ↑ "Bria Valente". Purplemusic.ch. February 23, 2012. Retrieved June 10, 2012. ↑ "Prince Posts Clip for New Song 'Screwdriver'". Rolling Stone. January 23, 2013. Retrieved January 24, 2013. ↑ "3rdeyegirl tour dates". Drfunkenberry.com. Retrieved August 31, 2013. ↑ "Bobby Z. Will Play "Purple Rain" With Prince at the Myth!". Drfunkenberry.com. May 24, 2013. Retrieved August 31, 2013. ↑ "Prince & Kobalt Make Marketing & Distribution Deal Official". Drfunkenberry.com. May 20, 2013. Retrieved August 31, 2013. ↑ "3RDEYEGIRL – PLECTRUMELECTRUM". New Album – PLECTRUMELECTRUM. Archived from the original on December 29, 2013. Retrieved September 30, 2014. ↑ Rahman, Ray (August 19, 2013). "Dave Chappelle and Prince, together at last! (Sort of)". Entertainment Weekly. Retrieved August 21, 2013. ↑ "Prince to charge $10 for live shows". BBC News. February 5, 2014. Retrieved February 5, 2014. ↑ Bychawski, Adam (February 13, 2014). "Prince's Band Release Live Footage of Shepherds Bush Empire Gig". NME. Retrieved April 22, 2016. ↑ "Purple Rain Deluxe Edition". Super Deluxe Edition. April 18, 2014. Retrieved August 10, 2015. ↑ "Prince Fans Prepare for the Deluge". NPR. April 19, 2014. Retrieved April 24, 2014. ↑ "A day with Prince at Paisley Park". Bigstory.ap.org. Retrieved September 11, 2017. ↑ "Prince records tribute to Baltimore and Freddie Gray". The Guardian. May 1, 2015. Retrieved May 5, 2016. ↑ "Prince to release song dedicated to Baltimore". The Baltimore Sun. May 2, 2015. Retrieved May 5, 2016. ↑ Steve Forrest; Ben Brumfield (May 1, 2015). "CNN Exclusive: Prince records ode to Baltimore after Freddie Gray protests". CNN. Retrieved May 9, 2016. ↑ Jess Denham (May 1, 2015). "Baltimore riots: Prince records tribute song after Freddie Gray dies in police custody". The Independent. London. Retrieved May 9, 2016. ↑ Ratliff, Ben (2015-05-11). "Review: Prince, in Baltimore, Nods to Unrest in Song and Asides". The New York Times. ISSN 0362-4331. Retrieved 2018-12-26. ↑ Derschowitz, Jessica (December 12, 2015). "Prince releases HITNRUN Phase Two on Tidal". Entertainment Weekly. Retrieved May 12, 2016. ↑ "Prince Melbourne review. Five stars for the most intimate Australian show of his career". Sydney Morning Herald. Retrieved February 17, 2016. ↑ Lambert, Brian (May 11, 2016). "Minneapolis doctor who was treating Prince is identified". MinnPost. Retrieved May 11, 2016. 1 2 Horgen, Tom (April 16, 2016). "'All's good' with Prince, back in Chanhassen after emergency landing". Star Tribune. Retrieved April 21, 2016. 1 2 "Music News: Prince appears at Paisley Park to assure fans he's okay after health scare". April 17, 2016. Retrieved April 21, 2016. 1 2 3 4 5 Chanen, David (May 4, 2016). "Prince died amid frantic plans for drug addiction treatment". Star Tribune. Retrieved May 4, 2016. 1 2 Eligon, John; Kovaleski, Serge F. (April 22, 2016). "Clues to the Mystery of Prince's Final Days". The New York Times. Retrieved April 26, 2016. ↑ "In Prince's final days, video shows him on bike". WWLP. April 23, 2016. Retrieved April 26, 2016. ↑ Bream, Jon (April 17, 2016). "April 17, 2016: Prince offers a little speech and even less piano at Paisley to prove he's fine". Star Tribune. Retrieved April 21, 2016. ↑ Murphy, Esme (April 21, 2016). "Prince's Final Moments in Minneapolis". WCCO. Retrieved April 21, 2016. 1 2 Eligon, John & Kovaleski, Serge F. (May 4, 2016). "Friends Sought Help for Prince's Addiction, Lawyer Says". The New York Times. Retrieved May 4, 2016. and Eligon, John; Kovaleski, Serge F.; Coscarelli, Joe (May 4, 2016). "Prince's Addiction and an Intervention Too Late". The New York Times. Retrieved May 5, 2016. ↑ Variety Staff (April 21, 2016). "Prince Reportedly Treated for Drug Overdose Before Death; 911 Details Released". Variety. Archived from the original on May 7, 2016. Retrieved May 9, 2016. 1 2 Chanen, David (June 3, 2016). "Prince died from accidental overdose of fentanyl, medical examiner says". Star Tribune. Retrieved June 2, 2016. ↑ Strobl, A. Quinn (M.D.). "Press Release June 2, 2016" (Press release). Midwest Medical Examiner's Office. Retrieved June 2, 2016. ↑ Coscarelli, Joe (April 21, 2016). "Prince Is Dead at 57". The New York Times. Retrieved April 21, 2016. ↑ Wilber, Del Quentin; Ng, David (June 3, 2016). "Prince overdose: Authorities looking into how pop star obtained fentanyl". Los Angeles Times. Los Angeles: Davan Maharaj. Retrieved August 11, 2016. ↑ Date, Jack (April 28, 2016). "Search Warrant Issued for Prince's Paisley Park Estate". ABC News. Retrieved April 30, 2016. ↑ Dillon, Nancy (April 29, 2016). "Authorities raid Minnesota Walgreens where Prince reportedly picked up prescriptions for heavy-duty medications". Daily News. New York. Retrieved April 30, 2016. ↑ Carver County Attorney's Office (April 19, 2018). "Carver County Attorney Mark Metz announces no criminal charges following the Prince Rogers Nelson death investigation" (Press release). ↑ Montemayor, Stephen (April 20, 2018). "Carver County closes Prince death investigation with no criminal charges". Star Tribune. Retrieved April 21, 2018. ↑ Grinberg, Emanuella (April 24, 2016). "Prince death: What we know". Turner Broadcasting System, Inc. CNN. Retrieved April 24, 2016. ↑ France, Lisa Respers (April 26, 2016). "Prince had no will, says his sister". CNN. Retrieved April 27, 2016. ↑ Merriman, Rebecca (May 7, 2016). "700 people claim to be Prince's half-siblings as judge orders DNA tests to find legitimate heirs". Mirror. MGN Ltd. Retrieved May 10, 2016. ↑ "Prince's Vault Reportedly Drilled Open". ABC News. April 29, 2016. Retrieved April 30, 2016. ↑ Puente, Maria (May 6, 2016). "Genetic testing ordered on Prince's blood to handle 'parentage' claims". USA Today. Gannett. Retrieved May 6, 2016. ↑ Lozano, Kevin. "Prince's Remains on Display at Paisley Park in an Urn Shaped Like Paisley Park | Pitchfork". pitchfork.com. Retrieved October 24, 2016. ↑ Martinelli, Marissa (October 11, 2016). "Prince's Ashes Are Now on Display at Paisley Park in an Appropriately Regal Urn". Slate. Retrieved October 24, 2016. ↑ Bueno, Antoinette (April 21, 2016). "Celebs React to Prince's Death: Read Touching Tributes From Carmen Electra, Katy Perry, Madonna and More". Entertainment Tonight. Retrieved April 22, 2016. ↑ "Prince dead at 57, artists pay tribute". Fact. April 21, 2016. Retrieved April 22, 2016. ↑ Jaffe, Greg (April 22, 2016). "How did President Obama mourn Prince's death?". The Washington Post. Retrieved May 5, 2016. ↑ Carney, Jordain (April 28, 2016). "Senate passes resolution honoring Prince". The Hill. Retrieved April 30, 2016. ↑ "Parties, vigils, other tributes to Prince in many cities". CBS News. Associated Press. April 22, 2016. Retrieved April 22, 2016. ↑ "Purple Rain: Cities Across the Country Light Up in Memory of Prince". KTLA. April 21, 2016. Retrieved April 22, 2016. ↑ "Boston Honors Prince By Lighting Zakim Bridge, South Station Purple". WBZ-TV. April 21, 2016. Retrieved April 22, 2016. ↑ Tennery, Amy (April 21, 2016). "Social media explodes as Prince tributes mark death of music icon". Reuters. Retrieved April 22, 2016. ↑ Schwindt, Oriana. "'Purple Rain' Is Not on Netflix, But It Will Air on MTV Thursday Night As Part of Its Prince Takeover". Retrieved April 21, 2016. ↑ Solis, Steph. "Where to watch 'Purple Rain' this weekend". USA Today. Retrieved April 23, 2016. ↑ Russell, Erica. "Goodnight, Sweet Prince: 'SNL' to Honor Music Icon With Special Tribute". PopCrush. Retrieved April 23, 2016. ↑ Brown, August (April 25, 2016). "Prince album sales skyrocket after death". Los Angeles Times. Retrieved April 26, 2016. ↑ Caulfield, Keith (May 3, 2016). "Prince Sets Record With Five Albums in Top 10 of Billboard 200 Chart". Billboard. Retrieved May 5, 2016. ↑ Ahern, Sarah. "Bruno Mars Channels Prince in Rousing Grammys Tribute". Variety. Retrieved February 14, 2017. ↑ Vox, Tristan. "Purple Fame: An Appreciation of Prince at the Height of His Powers. Vanity Fair article from Nov 1984". Vanity Fair. Retrieved March 1, 2018. ↑ "Prince Resources at the Minneapolis Central... | Hennepin County Library". Hennepin County Library. Retrieved March 1, 2018. ↑ "Andy Warhol's Prince painting on a cover". Andy Earhole. February 28, 2017. Retrieved March 2, 2018. ↑ Cox, Gordon; Cox, Gordon (April 22, 2016). "Broadway Pays Tribute to Prince". variety.com. Retrieved February 22, 2019. ↑ "Prince, Smokey Robinson and more to be inducted into Rhythm & Blues Music Hall of Fame". June 6, 2016. ↑ "Billboard 200 Chart Moves: Prince's '4Ever' Marks Late Icon's 40th Charting Album". Billboard. Retrieved September 11, 2017. ↑ Minsker, Evan. "Unreleased Prince Songs Coming on New EP, "Deliverance" Shared: Listen | Pitchfork". pitchfork.com. Retrieved April 22, 2017. ↑ Flanagan, Andrew. "'Deliverance' Denied: Release Of Posthumous Prince Record Stopped By Judge". NPR.org. Retrieved April 22, 2017. ↑ "Universal to Release Prince's Vault Music, Post-1995 Albums". Rolling Stone. Retrieved September 11, 2017. ↑ "Universal presses bid to void music deal with Prince estate". Usatoday.com. Retrieved September 11, 2017. ↑ "Court Voids Universal $31 Million Deal With Prince Estate". Billboard. Retrieved September 11, 2017. 1 2 "Prince's 'Purple Rain' Hits Top 5 of Billboard 200 Albums Chart After Reissue". Billboard. Retrieved September 11, 2017. ↑ "Prince's 'Purple Rain' Expanded Edition Coming June 23 with Unreleased Tracks". Billboard. Retrieved September 11, 2017. ↑ "Listen to Prince's Original Version of "Nothing Compares 2 U" | Pitchfork". Pitchfork. Retrieved April 19, 2018. ↑ "Prince – Nothing Compares 2 U [OFFICIAL VIDEO] – YouTube". April 19, 2018. Retrieved April 25, 2018 – via YouTube. ↑ Aswad, Jem (April 23, 2018). "Prince Album of Previously Unreleased Material Coming in September (EXCLUSIVE)". Variety. Retrieved April 25, 2018. ↑ "Tidal will debut an unreleased Prince album in 2019". ↑ "Prince Estate Signs Deal With Sony Music to Re-Release 35 Catalog Albums". ↑ "Sony Music signs exclusive distribution deal with the Prince Estate - Music Business Worldwide". June 27, 2018. ↑ "Prince's Bible, Stage-Worn Clothing and Personal Documents Up for Auction". www.msn.com. Retrieved July 12, 2018. 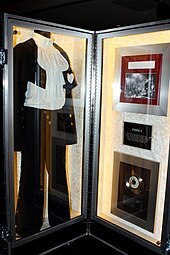 ↑ "Prince's personal tour bible and suit set to be auctioned off". Mail Online. Retrieved July 12, 2018. ↑ Birzniece, Elsa (August 16, 2018). "23 Prince albums made available to stream for the first time". Official Charts Company. Retrieved August 17, 2018. ↑ Pareles, Jon (19 September 2018). "Alone in the Studio in 1983, Prince Is Revealed". New York Times. Retrieved 20 September 2018. 1 2 Brown, August; Rottenberg, Josh (April 21, 2016). "Prince, master of rock, soul, pop and funk, dies at 57". Los Angeles Times. Archived from the original on 23 April 2016. Retrieved May 1, 2016. 1 2 3 Pareles, Jon (April 21, 2016). "Prince, an Artist Who Defied Genre, Is Dead at 57". The New York Times. Retrieved April 22, 2016. 1 2 Roberts, Randall (April 21, 2016). "Prince's secret weapon: a versatility that united pop genres under one roof". Los Angeles Times. Retrieved April 25, 2016. ↑ Reynolds 1990, p. 49–55. ↑ Erlewine, Stephen Thomas. "Prince Biography". AllMusic. Retrieved June 16, 2016. 1 2 Vivinetto, Gina (April 29, 2004). "Floridian: Prince and the Evolution". St. Petersburg Times. Retrieved March 26, 2012. ↑ Rosenberg, Alyssa (April 21, 2016). "Mourning Prince and David Bowie, who showed there's no one right way to be a man". The Washington Post. Retrieved April 22, 2016. ↑ Wilson, Carl (April 22, 2016). "The Purple One 151 53 Black or white, straight or gay, rock or R&B, male or female—Prince transcended every category". Slate. Retrieved April 23, 2016. ↑ Thrasher, Steven (April 22, 2016). "Prince broke all the rules about what black American men should be". The Guardian. Retrieved April 22, 2016. ↑ Hudak, Joseph. "Little Richard – 100 Greatest Singers". Rolling Stone. Retrieved August 17, 2015. ↑ White 2003, pp. 125–126. ↑ Reynolds, Simon (April 22, 2016). "How Prince's Androgynous Genius Changed the Way We Think About Music and Gender". pitchfork.com. Retrieved April 23, 2017. ↑ Forder, Rachel (October 19, 2005). "When Hip Gives Way to Hip Replacement". The Daily Telegraph. London. Retrieved June 23, 2018. ↑ "Prince death: Five strange stories about mysterious US musician". BBC News. April 22, 2016. Retrieved June 23, 2018. ↑ Escobedo Shepherd, Julianne (April 22, 2016). "Prince Spent His Life Elevating and Mentoring Women". The Muse. Retrieved April 22, 2016. ↑ Doris, Jesse (April 22, 2016). "Prince Was One of Pop Music's Greatest Champions of Women". Slate. Retrieved April 23, 2016. ↑ Nevins, Jake (August 14, 2017). "Pantone announces new purple shade in honor of Prince". The Guardian. Retrieved June 11, 2018. ↑ "The Prince Estate and Pantone Unveil Love Symbol #2 logo". Pantone. August 14, 2017. Retrieved June 11, 2018. ↑ Allen, Barry. "Prince's official purple now a recognized pantone color". river967.com. Retrieved June 11, 2018. ↑ Aswad, Jem (August 14, 2017). "Pantone Announces Official Prince Color: Purple 'Love Symbol #2'". Variety. Retrieved June 11, 2018. 1 2 3 4 5 6 7 8 9 10 11 12 13 14 15 16 17 18 Touré 2013, pp. 5–6. 1 2 3 Lavezzoli 2001, p. 87: "Prince has acknowledged George [Clinton]'s influence, as well as that of James Brown and Sly Stone." ↑ Gulla 2008, p. 494: "Prince had always been influenced by the bandleading style of James Brown, […]"
1 2 Lavezzoli 2001, p. 88. ↑ Gonzales, Michael A. (April 1996). "Mighty Mighty". Vibe. p. 81. Retrieved April 22, 2016. Mayfield—whose massive body of work has influenced everyone from Lenny Kravitz, Prince, and Vernon Reid to countless other soul singers, new jack producers, and hip hop heads—will never play the guitar again. ↑ Gulla 2008, p. 418. 1 2 Ro 2011, p. 9. ↑ Perone 2006, p. xii. ↑ Getz, Dana (April 22, 2016). "Stevie Wonder reflects on Prince: 'It's a heartbreak to lose a member of that army of love'". Entertainment Weekly. Retrieved April 22, 2016. ↑ Seymour, Gene (April 21, 2016). "A Prince We Followed Anywhere". CNN. Retrieved April 21, 2016. ↑ Remnick, Dave (April 21, 2016). "Prince Live". The New Yorker. Retrieved April 22, 2016. ↑ Werner 2006, p. 277. ↑ Cohn, Nik (April 21, 2016). "Prince, the godfather of R&B, had his fingerprints everywhere". GQ. Retrieved April 22, 2016. ↑ Ilahe, Ezadi; et al. (April 21, 2016). "'The World Lost a Creative Icon': Prince, Legendary Musician, Dies at 57". The Washington Post. Retrieved April 21, 2016. ↑ Hawkins & Niblock 2012: "Evidence of Prince's desire to control everything was blatantly apparent in the presentation of the credits on the album's sleeve: produced, arranged, composed and performed by Prince and a listing of the 27 instruments he played." ↑ Lynn, Samara. "Prince Understood the Value of Technology for Music Early On". Black Enterprise. Retrieved April 23, 2016. ↑ Wilson, Scott. "The 14 drum machines that shaped modern music". Fact. Archived from the original on August 11, 2015. Retrieved April 23, 2016. ↑ Rys, Dan (April 21, 2016). "Prince Dies at 57: Iconic Musical Genius Found Dead in Paisley Park". Billboard. Retrieved April 23, 2016. ↑ Jordan, Oscar (April 20, 2017). "Prince". vintageguitar.com. Retrieved February 22, 2019. ↑ June 10, Bill Murphy; 2016. "Dave Rusan: Building Prince's Cloud Guitar". www.premierguitar.com. Retrieved February 22, 2019. ↑ Hailstone, Dean (May 1, 2016). "A Look at Some of Prince's Guitars". playguitarlive.com. Retrieved February 22, 2019. ↑ Eric (September 26, 2011). "LEGENDARY GUITARS: Prince's MadCat Hohner Telecaster". legendary-guitars.blogspot.com. Retrieved February 22, 2019. ↑ "Prince's Telecaster - Ed's Guitar Lounge". edsguitarlounge.com. Retrieved February 22, 2019. ↑ Gear, Damian Fanelli 2017-04-21T17:05:26Z. "See the Purple Special, the Last Guitar Made for Prince". guitarworld. Retrieved February 22, 2019. ↑ "Gus Guitars latest news..." www.gusguitars.com. Retrieved February 22, 2019. ↑ Mafi, Nick. "The Strange and Lucky Tale of the Man Who Made Prince's Last Guitar". HWD. Retrieved February 22, 2019. ↑ Gear, Leslie Swiantek 2017-07-07T18:14:18Z. 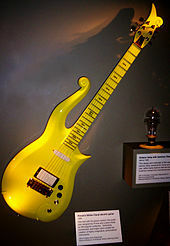 "The Guitar That Prince Left Behind". guitarworld. Retrieved February 22, 2019. ↑ Bartleet, Larry (April 22, 2016). "21 Artists Who Wouldn't Be The Same Without Prince". NME. Retrieved February 22, 2019. ↑ McCormick, Neil (April 24, 2016). "Prince influenced everyone from Madonna to Beyoncé". Retrieved February 22, 2019 – via www.telegraph.co.uk. ↑ Davis, Lisa Kay (April 21, 2016). "Prince Fought Big Labels For Ownership, Artistic Control". NBC News. Retrieved May 5, 2016. ↑ Heatley 2008, p. 191. ↑ "Pop Cult". Books.google.com. p. 63. Retrieved December 23, 2017. ↑ "Prince To Sue YouTube, eBay Over Unauthorized Content". Billboard. September 14, 2007. Retrieved May 6, 2016. ↑ Hamilton, Fiona (September 13, 2007). "Prince takes on YouTube over clips". The Times. London. Archived from the original on September 7, 2008. Retrieved May 5, 2016. ↑ Francescani, Chris (October 26, 2007). "The Home Video Prince Doesn't Want You to See". ABC News. Retrieved May 5, 2016. ↑ Lenz, Stephanie (February 7, 2007). "Let's Go Crazy" #1. Retrieved March 30, 2016. ↑ Gibson, Owen (November 7, 2007). "Prince threatens to sue his fans over online images". The Guardian. Retrieved July 18, 2009. ↑ "Prince 'not suing fans': Singer hits back at fansite claims". NME. November 9, 2007. Retrieved November 27, 2017. ↑ Kreps, Daniel (November 9, 2007). "Prince Releases Diss Track As Battle With Fans Gets Funky". Rolling Stone. ↑ Kiss, Jemima (November 15, 2007). "B3ta bates Prince". The Guardian. Retrieved May 9, 2016. ↑ "Prince Is Being A "Creep," Radiohead Tell Him He's A Loser". StereoGum. May 30, 2008. Retrieved December 6, 2014. ↑ "The Raspberry Beret Lifetime Aggrievement Award". Eff.org. May 7, 2013. Retrieved August 31, 2013. ↑ "Prince Inducted into Takedown Hall of Shame With New Lifetime Aggrievement Award | Electronic Frontier Foundation". Eff.org. May 7, 2013. Retrieved August 31, 2013. ↑ "Prince v. Chodera". Scribd.com. Retrieved September 30, 2014. ↑ Rothman, Lily (January 27, 2014). "Prince Files Lawsuit Against Facebook Fans Over Bootlegged Concerts". Time. Retrieved September 30, 2014. ↑ Michaels, Sean (January 27, 2014). "Prince sues internet users for total of $22m over alleged bootleg recordings". The Guardian. Retrieved September 30, 2014. ↑ "Prince v. Chodera – Voluntary Dismissal Without Prejudice". Scribd.com. Retrieved September 30, 2014. ↑ "Alpocalypse Now: 'Weird Al' Yankovic Says 'Twitter Saved My Album'". WIRED. Retrieved May 1, 2016. ↑ Nilsen 2003, p. 125. ↑ Elan, Priya (September 20, 2008). "Purple Reign". The Guardian. Retrieved May 5, 2016. ↑ Garcia, Mayte (2017). The Most Beautiful: My Life with Prince. Orion Publishing Co. ISBN 9781409171201. ↑ Kennedy, Dana; Sinclair, Tom (December 20, 1996). "Prince's Saddest Song". Entertainment Weekly. Retrieved May 12, 2016. ↑ Levy, Daniel S. (July 27, 2006). "Prince's Wife, Manuela (Partner of five years), Filed for Divorce". People. Retrieved May 4, 2016. ↑ Catherine Censor Shemo (October 1997). "A Prince of a Guy". Vegetarian Times. pp. 79–83. Retrieved May 6, 2016. ↑ Prince at Lopez Tonight. April 15, 2011. Retrieved April 21, 2016 – via YouTube. ↑ Saelinger, Tracy (April 22, 2016). "Off stage, Prince was a passionate and quirky food lover, too". Today. Retrieved May 5, 2016. ↑ Faber, Judy (May 22, 2006). "Prince Is Voted 'Sexiest Vegetarian'". CBS News. Retrieved May 9, 2016. ↑ Pollard-Post, Lindsay (April 21, 2016). "The Animal Kingdom Has Lost Its Prince". PETA. Retrieved May 5, 2016. ↑ Koh, Elizabeth (April 21, 2016). "Six things about Prince you forgot or never knew". The Kansas City Star. Retrieved April 21, 2016. ↑ Hoffman, Claire (November 24, 2008). "Soup With Prince". The New Yorker. Retrieved May 5, 2016. ↑ Hagerty, James R.; Audi, Tamara (April 24, 2016). "Prince's Little-Known Life". The Wall Street Journal. Retrieved April 27, 2016. ↑ Michaels, Sean (June 11, 2009). "Prince refuses hip surgery because of his faith". The Guardian. Retrieved May 5, 2016. ↑ Hopfensperger, Jean (May 4, 2016). "'We lost a spiritual brother' in Prince". Star Tribune. Minneapolis, MN. Retrieved June 16, 2016. ↑ Harwin, Steven F., MD; Pivec, Robert, MD; Johnson, Aaron J., MD; Naziri, Qais, MD; Mont, Michael A., MD (August 1, 2012). "Revision Total Hip Arthroplasty in Jehovah's Witnesses". Orthopedics. Healio. 35 (8): e1145–e1151. doi:10.3928/01477447-20120725-11. Retrieved June 16, 2016. ↑ Wittman, P. H.; Wittman, F. W. (1992). "Total Hip Replacement Surgery without Blood Transfusion in Jehovah's Witnesses" (PDF). British Journal of Anaesthesia. Oxford University Press. 68: 306–30. doi:10.1093/bja/68.3.306. Retrieved June 6, 2016. ↑ Bonnett, C. A.; Lapin, R.; Docuyanan, G. B. (January 16, 1987). "Total hip replacement in Jehovah's Witnesses under spinal anesthesia without transfusion". Orthopedic Review. MEDLINE. 16 (1): 43–47. PMID 3453957. ↑ wilkins, sara (April 23, 2016). "Jimmy Jam Opens Up About Prince's Hip Issues". Your Daily Dish. Retrieved June 17, 2016. 1 2 3 Einenkel, Walter (April 23, 2016). "The breadth and power of Prince's activism begins to be revealed after his death". Daily Kos. Retrieved April 23, 2016. ↑ Chipman, Melissa (April 21, 2016). "Prince made secret donation to support Louisville's historic Western Branch Library in 2001". Insider Louisville. Retrieved April 22, 2016. ↑ Melendez, Monique (April 27, 2016). "Prince Paid Off 'Funky Drummer' Clyde Stubblefield's Medical Bills". Billboard. Archived from the original on May 5, 2016. Retrieved May 4, 2016. ↑ Guynn, Jessica (April 21, 2016). "Prince remembered as innovator, advocate for Black youth". USA Today. Retrieved April 22, 2016. ↑ Coscarelli, Joe (March 19, 2016). "Prince Announces Coming Memoir at Performance". The New York Times. Retrieved May 5, 2016. Moskowitz, David V. (2015). "Prince and the Revolution (1979–1986)". In Moskowitz, David V.